On Friday Jacek and I went to stay at the beautiful, four star, Killashee House Hotel and Spa in Naas, Co. Kildare - you can read about our experience here. Whilst we were there we enjoyed lots of delicious food and one culinary experience we particularly enjoyed at the hotel was the afternoon tea. I love going for afternoon tea, I think it's a real treat and it's something I always enjoy - I mean, who doesn't like cakes?! The afternoon tea is served in the hotel's Bistro restaurant and we were seated by a window overlooking the front grounds of the hotel. All of the staff in the Bistro were so friendly and accommodating. One girl in particular, I sadly didn't get her name, was very helpful and made sure that we had everything we needed for a happy and enjoyable afternoon tea experience. Upon seeing the afternoon tea menu I was delighted to see lots of different flavours and things to try out. Then Jacek and I did our negotiating as I don't eat fish or like coffee so he had to have the Oak Smoked Irish Salmon sandwiches while I had both Egg, Parsley and Lemon Mayonnaise. He also had to have both Coffee Mocha Cup pastries while I had the Coconut Walnut Whip - which were absolutely delicious, I'd love to be able to buy them somewhere! There are two afternoon tea options available at the hotel, traditional or sparkling - the sparkling option is €5 more and naturally we went for that, after all, we were away for the night and decided we deserved a drink after our long drive from Cork to Kildare. The afternoon tea arrived quite quickly and everything looked fab. I loved that each tier had some colour to it, it made it look even more appetising. It was all presented really well and we couldn't wait to dig in. The fruit scones were very fresh and were delicious with the cream and raspberry jam - my favourite combo when it comes to a scone. The sandwiches were all fresh and oh so delicious too. I really liked the tomato chutney with the honey backed ham and Old Dubliner cheese and that was definitely my favourite sandwich. The pastries were fab, the Coconut Walnut Whips and the Raspberry and Mango Battenburgs were definitely my favourite from all that was on offer. Everything was fresh and made just as they should be. Nothing tasted dry - a bug bear of mine when it comes to cake, and it was great to have such a variety of flavours to sample in one sitting. The Lemon Meringue Macaroons were also a favourite of mine and I think lemon flavoured treats are a great addition to a summers afternoon tea. The Strawberry Shortcakes were 'melt in the mouth delicious' and I had never seen milkshakes as part of an afternoon tea menu before but the Strawberry and Lime Milkshakes were very refreshing after all the pastries and cakes. The Red Velvet Cake Pops were a really fun addition to the menu too. I think it's always great when a restaurant puts their own quirk to an afternoon tea and I think Killashee's afternoon tea menu is definitely original. Overall, we were very impressed with Killashee's afternoon tea offerings. As I said above, I loved how colourful everything looked when it was presented to us, the food was all fresh tasting and I loved that there were so many different flavours for us to try too. The afternoon tea menu seemed really well thought out and done in a way to provide the best culinary experience possible for guests. 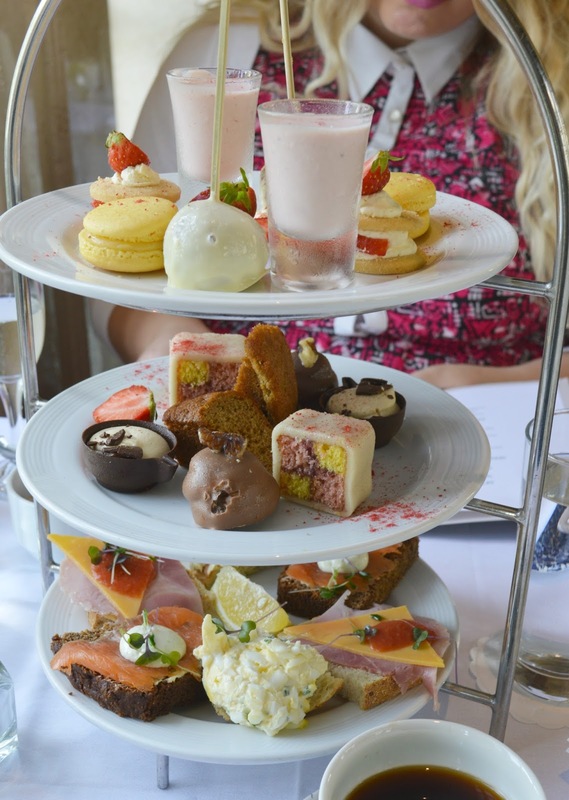 I think Killashee's afternoon tea is very reasonably priced at €25 per person (€30 if you want the sparkling option) and if you ever find yourself in the vicinity of Co. Kildare I think it's the perfect treat to enjoy and spoil yourself a bit with. *We were guests of Killashee House Hotel and Spa and afternoon tea was complimentary for us, however, as always, all thoughts and opinions are 100% my own. I do love a good afternoon tea and this looks absolutely fantastic. Glad you had a lovely time. This is RIIIIIIIGHT up my street, I've hit all the local AT spots, i'm running out of new ones to find! How cute is this!!!!! The cakes looks so delicious. Yes, I love afternoon teas too. Oh my, that looks amazing. Afternoon tea is on my wishlist! Wow it is amazing that you were gifted a wonderful time at the hotel. The afternoon tea looks spectacular.